Intentionally engage students in Science and Engineering Practices. Start with an anchoring phenomenon students want to understand. Create opportunities to assess students’ Science Practices. Use Crosscutting Concepts to connect learning across disciplines. 1. Intentionally engage students in Science and Engineering Practices. My colleagues and I develop our curricula around a belief that students who regularly engage in these Practices are better equipped to learn specialized disciplinary content with greater autonomy compared to students taught in a more traditional, content-centric model. For example, a student with well-developed NGSS Practices can develop targeted questions when presented with a phenomenon, plan and carry out investigations, analyze and interpret data to develop models, and construct explanations around that phenomenon, with little if any need for teacher-directed instruction. Subsequent articles in this series will focus specifically on how we are teaching and assessing the NGSS Science and Engineering Practices, and how we develop units of study using the Practices around a central phenomenon. 2. Start with an anchoring phenomenon students want to understand. While a phenomenon may be complex in terms of the fundamental laws that explain it, the actual events we present our students are often quite simple. For example, we begin our investigations into matter properties and interactions with an evaporation “race”. Students design an experiment to test how quickly six different liquids evaporate from a lab bench (we use water, some alcohols, and hexane). 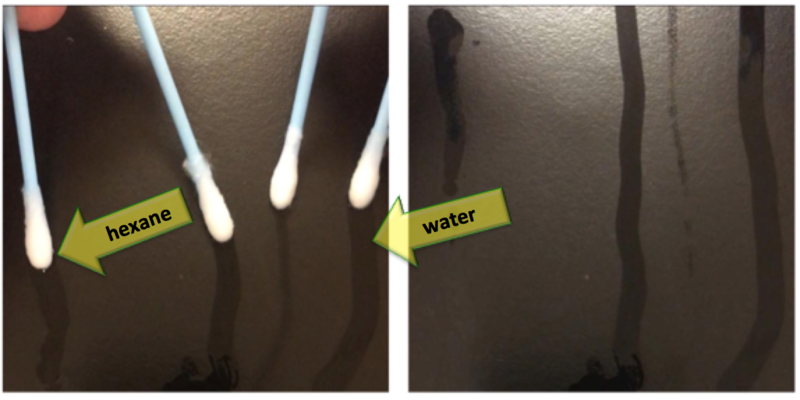 Students are astonished at how rapidly the streak of hexane evaporates, while the water streak remains past the end of class (see figure 2). We seize a “Did you see that? !” moment and provide students structured time to wonder why it happened and to construct quick models that might explain what they observed. When students realize their models are too limited to explain a phenomenon, we provide them time to ask questions, design investigations, analyze and interpret new evidence, refine their models, and construct new explanations surrounding the phenomenon. Students now use this seemingly simple phenomenon to help explain complex concepts including Coulombic interactions, differences in melting and boiling temperatures, bond characteristics, bond and molecular polarities, dissolving and dissociation, and why polar molecular and ionic substances are insoluble in nonpolar molecular substances. Paul Andersen’s website is an excellent resource for all science teachers looking for age and content-appropriate phenomena. Subsequent articles in this series will elaborate on the phenomena we’re using in our general chemistry course and how we leverage them to scaffold complexity and help students connect with content. 3. Assess Disciplinary Core Ideas and Science and Engineering Practices. (Our assessments are scaffolded in complexity and this example represents an entry-level prompt). Compare the graphical data for the two elements listed above. List at least two similarities in patterns that you observe. Contrast the graphical data for the two elements listed above. List at least one difference in patterns that you observe. In the space provided, construct a model for the elements to help support the description of the differences and similarities you’ve identified above. Which element, A or B, has a higher 1st ionization energy? Justify your answer using scientific reasoning. On the graph, circle the electrons you believe are located in the lowest (“innermost”) energy level for each element. Justify the difference in ionization energies for these inner electrons for element A and B by using scientific reasoning. Later articles will delve deeper into our attempts to meet the challenges posed by assessing student understandings and proficiencies against NGSS Disciplinary Core Ideas and Science and Engineering Practices. 4. Use Crosscutting Concepts to connect learning across disciplines. Our goal in chemistry is to consistently and explicitly draw our students’ attention to these Crosscutting Concepts as we are engaged in them. In the front of every science classroom, we have posters for each Concept and we try to consistently ask students to consider which are reflected in the current Disciplinary Core Idea we are uncovering (see figure 3). We may also ask students to consider previously-studied science disciplines and recall a Core Idea that connected to the same Crosscutting Concept. (We also do this for the Science and Engineering Practices). Another strategy we are employing more consistently is to use smaller versions of the same posters in posting our students’ learning outcomes for each lesson (figure 4). Crosscutting Concepts are one of the three dimensions, along with Science and Engineering Practices, and Disciplinary Core Ideas that comprise NGSS Three-Dimensional Learning. Our goal as science educators is to provide our students with a true three-dimensional experience in learning and practicing science. Future articles in this series will dive deeper into each of the four strategies we identify as highly-impactful in helping our students learn to be better scientists, as well as provide practical examples of how we’re implementing them. This is our attempt to share what we’re learning and to continue to build a community of practice among science educators striving to successfully implement Next Generation Science Standards for our students. Special thanks to Lauren Bowers, Jeff Vogt, and Rigel Crockett for the foundational work implementing NGSS in the course I now teach; to Paul Andersen and Christopher Zieminski for their continuing consultation and support; and to our current chemistry team at American School of Dubai: Lauren Bowers, Zohra Backtash, and Vivian Huang. Science Practices Diagram. https://www.sciencepracticesleadership.com/diagram.html. (accessed Mar 3, 2019). Andersen, P., NGSS Phenomenon. https://thewonderofscience.com/phenomenal. Also Science and Engineering Practices and Crosscutting Concepts posters and (accessed Mar 3, 2019). NSTA. Crosscutting Concepts. https://ngss.nsta.org/CrosscuttingConceptsFull.aspx. (accessed Mar 3, 2019).